Unleash your inner beauty by donning an accessory that complements your everyday outfit. Wear the Rose Gold Riviera Stone Bezel Braided Black Bracelet from Pura Vida and be amazed as it turns your simple daily look into a classy one! This simple yet one-of-a-kind accessory is easy on the eyes and convenient to wear with its lightweight and compact construction. It is crafted with a beautifully attached plated "P" charm, marking the authenticity of Pura Vida. Embellished with a delicate gold Riviera stone bezel in a bitty braided band, the dainty accents greatly adds sophistication to the bangle's overall look. Designed to give your fashion statement a hint of elegant tone and shade, this bracelet comes in a sophisticated color to complete your daily getup. Finished with a waterproof structure so you can surf, snowboard, swim, or take a shower with them on, this premium bracelet will not lose its color or disintegrate even when water comes in your way! 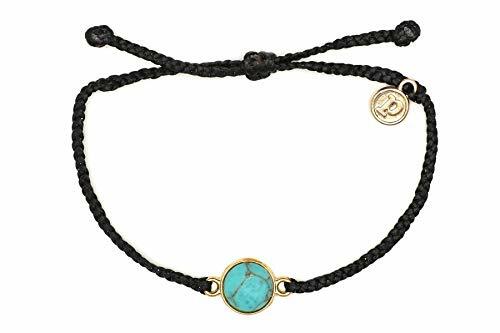 The Pura Vida Gold Riviera Stone Bezel Braided Black Bracelet is available in different colors so you can pick your preferred style! Adjust the band from two to five inches in diameter to create its perfect fit on your wrist. ADJUSTABLE SLIPKNOT TIE - This accessory comes with an adjustable band that allows wearers to create the perfect fit for them. The bracelet's band can be adjusted from 2 to 5 inches in diameter. AVAILABLE IN TWO COLORS - The Gold Riviera Stone Bezel Braided Bracelet from Pura Vida is available in two shades-cream and black colored bands-so you can choose one that perfectly matches your style and charisma!